Learn how to cope with menopause with effective Hypnotherapy by Steve G. Jones! Don’t suffer any longer !!! It’s easier than you think. You’ll see a new you and you’ll feel great about it!!! Steve G. Jones, Ed.D., Clinical Hypnotherapist, charges $1,500 for a custom recording and $25,000 for a one-hour private hypnotherapy session at his office, but you can get all the benefits for this low price. Simply listen to the Menopause Hypnosis MP3 every night as you go to bed for three weeks and feel the changes happening in your life. You will feel more empowered, more in touch with your true self, and you will truly know that your goals are within your reach. And as you continue to relax you realize just how beautiful you are. You are a very beautiful lady. You have blossomed into a very, very wonderful being and you are able to pass through the stages of life easily and in a very relaxed way. As you now look forward to that time in your life, that time where you have passed the child bearing years, that’s right. And see yourself moving into that phase of your life in a very relaxed and powerful way. You realize now that you are a wonderful, beautiful woman and you are always relaxed in every phase of your life. You are very comfortable being you. You are very comfortable with your body and you realize that day by day the physiological functions on your body are becoming more and more relaxed allowing you to have a very stable temperature, allowing your moods to be very stable, allowing your hormone regulation in your body to be as it should be, normal and in balance, very much in balance, complete balance, harmonious balance. Your mind is clear. Your body is relaxed. You are happy and so proud of yourself in a positive way. Proud that you have reached this stage of your life where you deserve respect and you will respect yourself. Respect yourself as the beautiful being you are and you’re relaxed. You relax more and more day by day, feeling very comfortable with yourself, very relaxed and peaceful, very happy to be at this stage of your life. So relax now, relax and drift and realize just how beautiful you are. Menopause is a natural process that every woman will go through during her lifetime. The physical and emotional side effects of menopause are numerous including changes in hormones, hot flashes, difficulty sleeping, and mood swings to name a few. The good news is that hypnotherapy can help you cope with the process of menopause. For many women, menopause can last for a long time. Menopause Hypnosis MP3 recording can help you deal with the symptoms and side effects of menopause. Once you have been diagnosed by a doctor and you know you are going through menopause, realize that hypnosis can help with your symptoms. 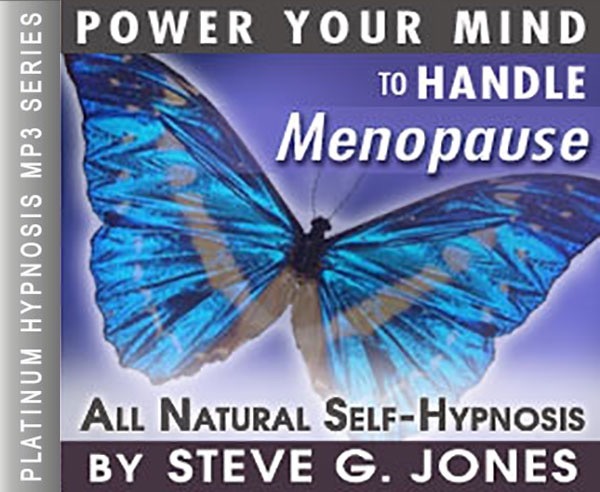 This powerful Menopause Hypnosis MP3 session will help relieve your menopause symptoms. We suggest you listen to the recording for 21 nights in a row before going to sleep at night. The suggestions your subconscious mind will hear will help you better cope with menopause. We also suggest you listen to the recording once a month or more often after the initial 21 nights as long as you experience slight menopause symptoms.